Handy disc that sits securely on stove tops to support small based items such as small pots, coffee pots and espresso makers when boiling. Gas reducer ring For years I have tried to replace my old gas ring reducer which somebody threw out! This one is even better than the last and it is great for stabalising my esspresso coffee pot & small milk pan. 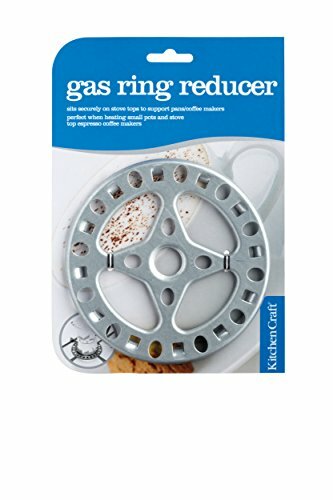 Gas Reducer Ring Pretty simple device and accomplishes what it sets out to do. The ring comes with some sort of manufacturing grease on it which could be the cause of the smoking that some reviewers mentioned, what I did was wash it in hot soapy water for a bit and it was fine. Cheaper than a new house Imagine the scene if you will. It is the first morning in your new house. The sun streams through the curtainless windows. You pick your way among the packing cases to retrieve the stove-top coffee maker, grinder and coffee beans you have wisely kept out of the hands of the removal men.